Contains high antioxidant level of 9% vs 5-6% for mass-market teas. Character: Delicate, very light liquoring with notes of pine & honey. The cloud kissed and mist blown slopes Near Adam's Peak are blessed with some of the finest teas on Earth. 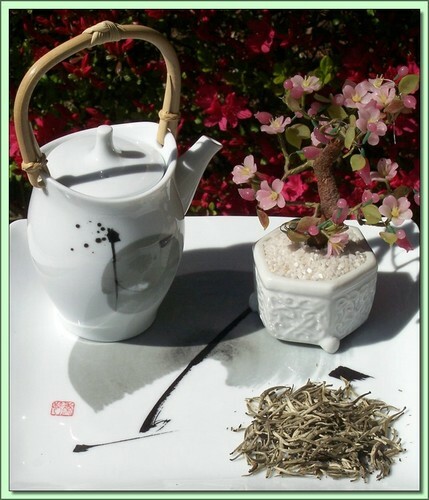 This white tea is especially rare as only 30 kilos are made on a weekly basis. Only the best fresh shoots are selected and then withered and sun dried. The tips are silvery and have fresh fuzz similar to that on a peach. The heady aroma is unlike that of other teas and is somewhat piney. The subtle taste may only be appreciated with an experienced palate, and we encourage tea lovers to initiate themselves to a rare gem. Adam's Peak is one the most sacred mountains in the world to Buddhists, Hindus, Muslims and Christians. This tea has been found to be very high in polyphenols - the antioxidants found in tea. Hot Tea: This tea is best enjoyed by pouring 180F/90C water over the leaves (1-1 1/2 teaspoons into your cup) for 3 minutes (longer=stronger). Don't remove the leaves. Can be infused repeatedly 2-3 times using higher temperatures & shorter infusions until flavor is exhausted.